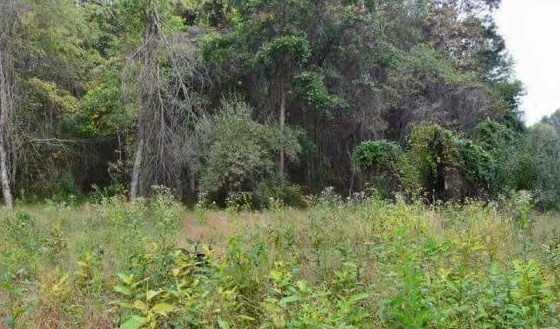 Nothing quite makes a mess of a property like a lot of overgrown brush and trees. This kind of growth is not only a terrible eyesore but it also uses up space and makes areas on your otherwise-expansive property non-functional. If you have areas of overgrowth such as this, then you need a solution that will allow you to get full enjoyment out of your property by clearing it out. While you may be ready to make some changes, you may not quite know where to turn. There are multiple options out there which can make it confusing. You’re looking for a company to steer you in the right direction so that you can get your property the way you truly desire it to be. Whether your property backs up to a wooded area, has a nearby pond with plant overgrowth on the banks, or you just have land that’s become overrun by an invasive plant species, getting rid of all that material can open up your space and create many new possibilities. There are many reasons why you may want to transform your property and get rid of overgrowth. Perhaps you want to get back that great view that’s behind all that plant material. Or, you’d rather have more land and more grass than a bunch of mangled trees and shrubs. You want a space that you can use your ATVs on, ride horses, go for a hike, or even just let the kids run free on. Maybe that’s what you’ve always envisioned when you bought a home with a lot of property. 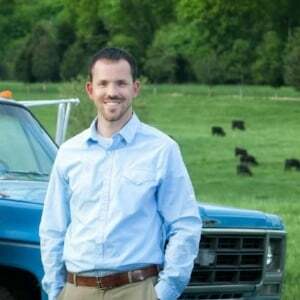 We’ve even had clients who purchased farmland but needed it cleaned up in order to be used. And we had one landowner who had multiple acres that he wanted to sell to the municipality for potential park space but in its current state of overgrowth, it was undesirable. Whatever the reason may be that you’re looking to clear your land, you know that going at it with a hatchet, a chainsaw, or a string trimmer could take you weeks, months, or maybe even years. That growth will just keep growing, probably faster than you can knock it all down with hand-held tools. And trying to rent larger equipment on your own is potentially dangerous and likely not even cost effective when you look at how much a rental fee would be. So you’re exploring your options for hiring a professional service. In that search, you may come across various potential solutions and you’ll be tasked with trying to determine what’s best. It can be confusing as some companies use terms interchangeably despite the fact that they are very different services. Let’s explore two options that you may come upon, and what they mean, in order to clear up any confusion. Both of these terms have been used improperly and that has created a misunderstanding as to what exactly they are. Bush hogging is the action of using a device (called a bush hog) that is pulled behind a tractor to cut vegetation and clear land. A bush hog has one or more blades that spin to make cuts and tears. While it serves a purpose with areas that don’t have too much overgrowth, bush hogging would not be an appropriate solution for clearing a larger area with a lot of brush as it is not large enough or properly equipped for that kind of work. Since it is essentially “dragged” over the land, it is more for low-growing vegetation. In general, it is a much more limited attachment than forestry mulching, which we will also cover. 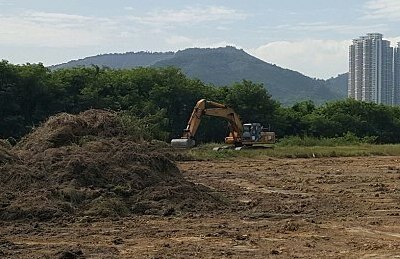 When talking about land clearing, you’re looking at bringing in very large equipment, which is something that excavating companies do. The equipment may vary but they’ll likely use large pieces such as bulldozers, which are going to be incredibly disruptive to your property. 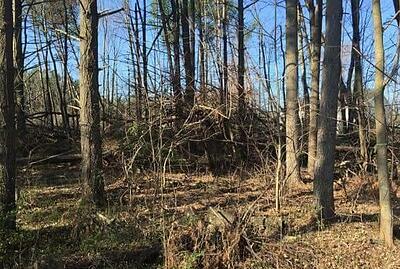 Land clearing is something that you might hear about in terms of taking down part of a forest—not just taking down a couple acres of overgrowth on your Northern Virginia property. Land clearing is going to be destructive to the land in terms of leaving ruts and damage from the large machinery that would have to be driven around on your property. 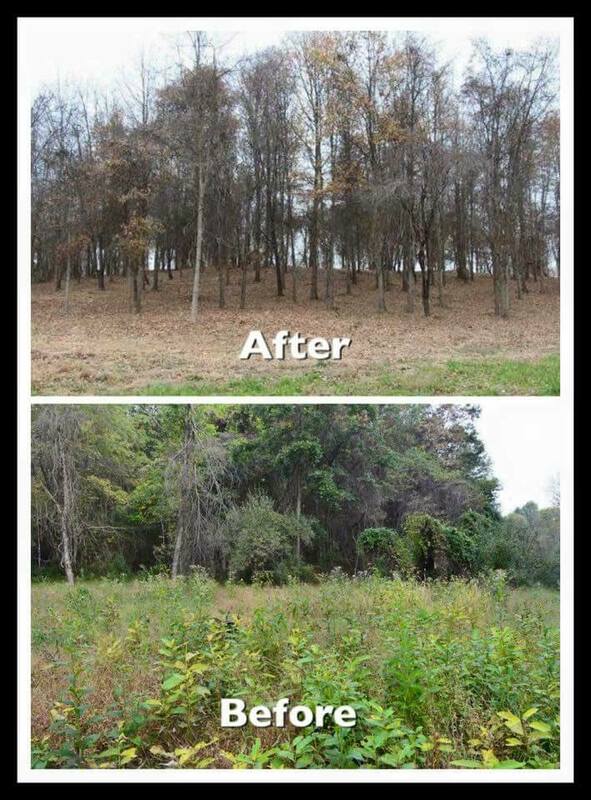 Now that we’ve discussed two other options that may come up in your research, let’s look at what we consider the best option for clearing brush and trees on your large property. Forestry mulching is more cost-effective, much more efficient, and of course, a less-disruptive alternative to land clearing. 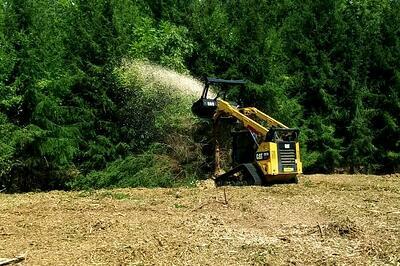 Unlike bush hogging, forestry mulching can deal with large areas, and even large trees. 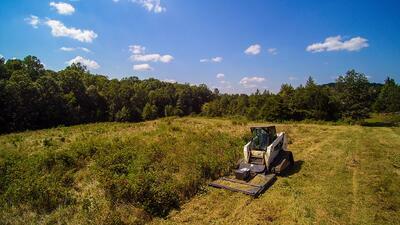 But unlike land clearing, the process is a lot more versatile and a lot less destructive to your property. Instead of dragging gigantic equipment onto your property and tearing everything up, the forestry mulching process can be performed with a specialized piece of machinery and in a selective fashion. Forestry mulching uses an attachment that you might think of as a “grinder on steroids,” which is then attached to a highly maneuverable skid-steer. That allows the operator to get into your tighter space without much damage and selectively take down the brush and trees that you want to be cleared. It’s not completely tearing up the ground or taking down trees that you want to be left alone. True to its name, the forestry mulching process takes trees and brush and turns them into mulch. This also eliminates the expense of transporting and disposing of debris or requiring it to be burned. Plus, there is zero waste involved in this process since the mulch is used on the land. Immediately putting mulch down is also beneficial to preventing erosion. Forestry mulching is undoubtedly the ideal solution for clearing brush and trees but when it comes to actually finding a company that provides forestry mulching in Virginia, particularly in our specific area, you are going to be hard-pressed. Most of the landscaping companies in Aldie, Leesburg, and Middleburg, VA have smaller machines that simply can’t do it all. Even if a company says their equipment can tackle the job, you have to consider that it might become very costly. That’s because most companies charge a day rate and smaller equipment is going to take a lot longer to complete the job than what could have been done with forestry mulching. The fact is that jobs may take 3 to 10 times longer, depending on what equipment they have. It also becomes a nuisance. 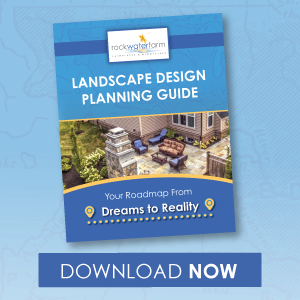 That’s a lot of time to deal with equipment on your property, and a lot of days of disruptive noise that both you and your neighbors must deal with. At Rock Water Farm, we offer forestry mulching in Aldie, Leesburg, and Middleburg, VA and have found that it’s definitely a desired service in our area. With many of our clients and potential clients, owning large pieces of land that are often situated in or around wooded areas, there is a great need for an effective clearing service and forestry mulching offers just that. 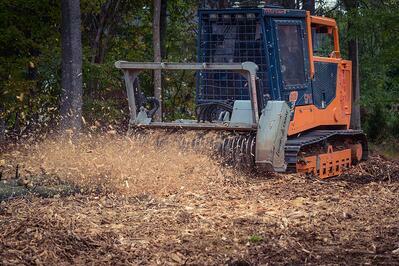 Forestry mulching has also been a popular service for us because it’s something that other companies just can’t offer. The specialized attachment necessary for forestry mulching is expensive and probably why other companies have not invested in it. But it’s an investment that we’ve made to better serve our clients. Rather than take days to perform a clearing job, forestry mulching allows us to take care of your clearing needs in a much more cost-effective, and speedy, manner. 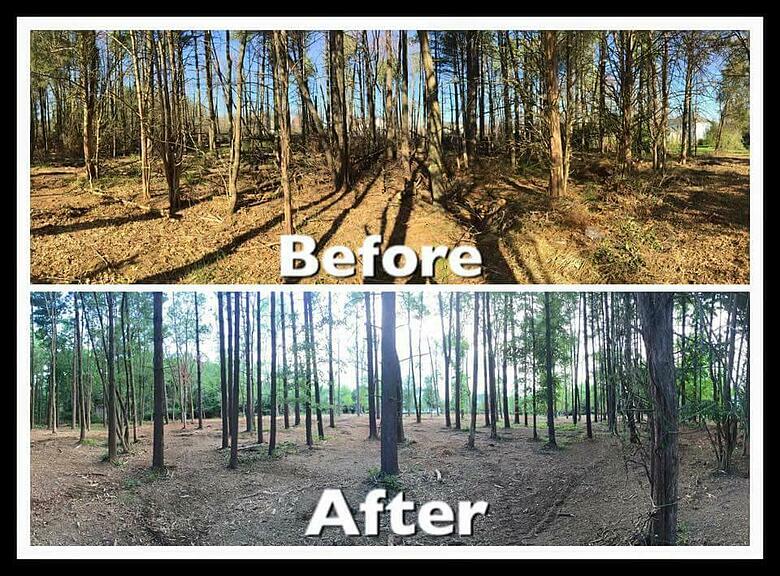 While you could just continue to deal with the mess, now that you know the option of forestry mulching is out there, this just may be the time to do something about it. Whether you’ve lived with this mess for a long time or you’ve just purchased your property, getting it cleared up as soon as possible will get your land on track to vast improvements. It’s amazing how transformative forestry mulching can be. Spaces that were once completely unusable or a horrible eyesore are cleared swiftly and effectively. But it all comes down to making that decision. Choosing the best possible service, and the best company, to have your space cleared will make a world of difference. Instead of continuing to suffer from the headache of overgrowth, you could take action now and have it all cleared away. When it’s completed, chances are, you’ll feel a wave of relief to have it all done. Your property will finally be the way you truly wanted it to be. 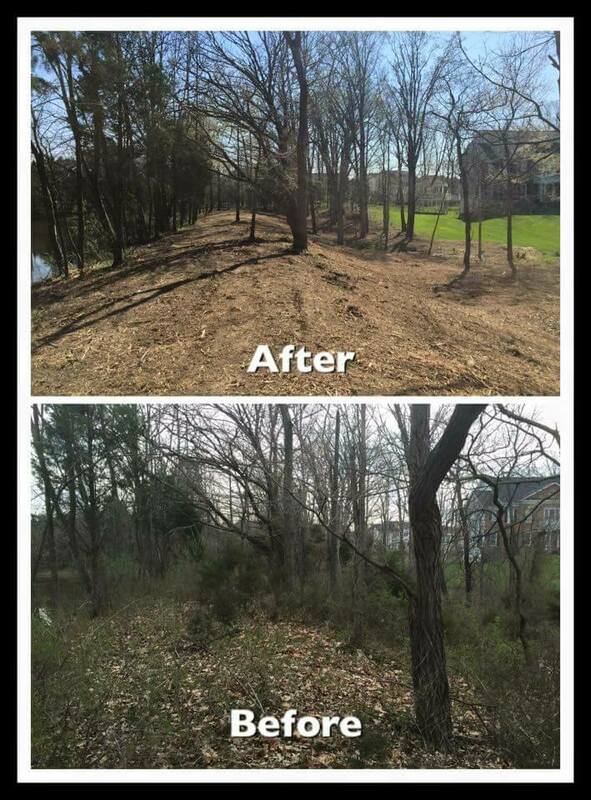 If you’d like for us to come to your property and discuss how our forestry mulching service may be able to transform your Aldie, Leesburg, or Middleburg, VA home, contact us for a free consultation or give us a call at 703-327-1636. We’d be happy to answer any of your questions.